Sorry for being so overdue. Blame it on the combination of Real World work, City Skylines shenanigans (I like City Painting), unwatched Autumn 2017 anime backlog (mostly cute stuffs), and Wikipedia. Without any delay. Here 4 consecutive release. ……That we had this whispering conversation was a secret. Perhaps because Ludwin realized that I was serious, he tightened his lips. Perhaps he was lost on how should he answer this. Then the other related party, Ginya , tilted her head. It was a relaxed tone that was unthinkable to be said by the related party. It was such a quick answer that it was anticlimatic, and then Ginya laughed. At Ginya’s confession, not only Ludwin, but even I, as an unrelated person, were staring in amazement, but only Liscia who was nodding repeatedly as if she was able to sympathize with Ginya. Ludwin, who returned to his sense after a while, made an anguished expression, and with a preface statement 「Your Majesty, please forgive me for my impolite answer」, he refused. The previous king Alberto had given his daughter Liscia to make me the king of this country. On the contrary, from Liscia’s viewpoint, in order to stop me to be the king of this country, she agreed to be married to me. Our relationship started in that twisted premise, but after surmounting trials and tribulation, it eventually become a connection that I absolutely didn’t want to separate from. While I scratched my head, I told Ludwin. When I said this, Liscia sent me a passionate look. It was a bit embarrassing. Even if it is a useful invention, it wouldn’t do if it suddenly sinks the country’s finance. When I turned my sight to her, Ginya was turning her head away and whistling (though no sound coming from her). Seeing her behavior, Ludwyn made a bitter smile. Ludwin turned his face towards Ginya. Ludwin’s face was bright red and Ginya’s face too was somewhat reddish. Though when they stood side by side Ludwin was taller, perhaps because his feet were trembling from the tension, their height looked the same. I was wondering whether this would work since he was that nervous, but the man standing here was the ikemen Royal Knights’ Commander who had led tens of thousands of soldiers. It was not long before he resolved his mind. And then, the two of them were shaking hands for some reasons. I thought, isn’t hugging suit this scene more…… Oh well, this way might suit them more. Since it was a happy situation, there’s no need to make an uncalled remark. I was glad that this matter had been resolved without a problem. ……Ah, that’s true. I had completely forgotten about this, but we didn’t visit this place to see inventions. Then, Ludwin dropped a fist into Ginya’s head. That being said, Ludwin held Ginya’s head and pushed it to the floor, while he himself was also lowered his head until his forehead pressed against the floor. The shape was slightly different, but this was this country’s style for Double Dogeza. While Ludwin restrained Ginya’s head, he expressed his apologies. No, even if you are apologizing with such efforts…… I didn’t really that bothered at all. I squatted down and looked straight eyes to eyes with Ginya before asking her. Do any of you still remembered what happened about six months ago? When I dug a hole for a sewage settling pond near the Capital City as a part of establishing the Capital City’s water and sewer services, we found bones of monsters and the likes. Amongst them, there was a set of huge dragon bone, but then it went missing. At that time, we first suspected that the dragon had died with a grudge and became a Skull Dragon, but in that case, it should have dispersed miasma to the surroundings. However, the Capital City where it was stored before was still safe and sound, so this possibility seemed unlikely. The next suspect was that it had been stolen by someone, but the reason for the theft was unclear. If there were some magic power remained in it then it could be used as magic catalysts or accessory material, but the magic power in that bone had disappeared and so it was worthless. In the first place, since it couldn’t be used for anything, I planned to display it in the museum, hence why I kept it. That’s why, in the end, we thought that perhaps a collector took it away (regardless of whether or not they would take a huge item like that). Although it was indeed a strange incident, it didn’t seem that it would lead to a major incident, so it gradually disappeared from my memory, but a few days ago, the truth was unexpected became clearer. There was a piece of paper mingled with Ludwin’s work documents. I will take the dragon bone so I’ll leave the rest of the procedure to you. Was something that briefly written inside of it. Yes... The one who took the Dragon’s bones was Ginya. She reported this in a piece of paper, and then without waiting for a reply, she took the bones away (by the way, I heard about this afterward, but it was transported by the golem). Even so, this was so…… Ginya-ish? At any rate, the paper was mixed with other papers due to the slightly chaotic period back then. And then, that paper was discovered a few days ago, Ludwin, who knew about the situation, came to me and made earnest apologies. And so, to confirm the location of the bones, we arrived at Ginya’s dungeon-atelier. The bones appearance had been completely changed…… or rather, not the appearance but the form itself had radically changed. When we asked about the location of the bones, Ginya lead us to the tent that occupied half of this huge room. 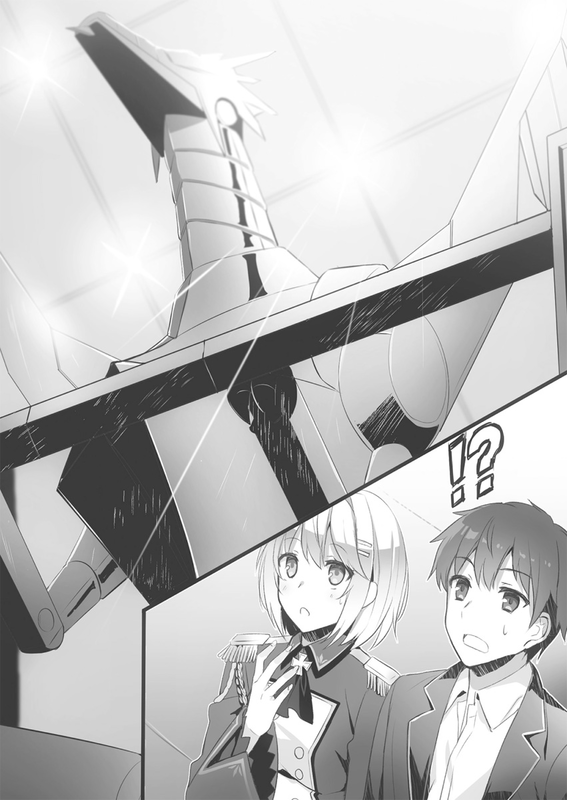 When we entered, what greeted our sight was the shining metallic body of a huge mechanical looking dragon. The moment I saw what could be called as 『Mecha-Dragon』, the low bass main theme of 『Godzilla VS Mechagodzilla』 was playing in my head . Though, it wasn’t as huge as them. The height was about 18 meters at most, but the form was out of this world. Giving a sidelong glance to us who was standing astonished, Ginya started to explain with full confidence. Ginya spoke of this happily…… but how should I put this? I only had a bad hunch about the monster parts and mysterious dungeon components. Liscia was also opening her mouth wide from surprise and Ludwin seemed about to faint. I then asked Zinya. Then, Ginya approached the Mechadra and then touched its foot. Are you a 「IMGONNAHKILLYOUNAAAAAAAOOOOOO!」 kind of person? …… Since they won’t get the reference, I let this tsukkomi slide. I see, although she had made a mechanical dragon, there weren’t a movement program and something to act as a circuit to transmit it. Or rather, this was something not unexpected from the scientific level of this world, but seeing what Ginya had done, it wasn’t like it couldn’t move at all. Ginya were moving the claw parts of the mechadra’s feet up and down with her hand. I held my head in great perplexion. As expected, won’t this situation could anger Star Dragon Mountains. To give an example in human terms, it was only to exhibit bones of ancient people in the museums, then they might allow it. However, when that bones were embedded inside a machine, as expected, some people will find this revolting. This could be taken as a sacrilege for the dead. If they know that the bones of their fellow kin were treated like this, in the worst case the dragons might attack. ……When I return back to the castle, I will send a letter of apology to the Star Dragon Mountains. Depending on their reply, we would disassemble, do a burial and send it back. I swore this in my heart, and then I remembered what Ginya had said. While producing the metallic creaking sound, Mechadra started to move. Whoa, I could manipulate this!? It seemed that even Ginya was surprised. While seeing the Mechadra moved its both arms up and down, I grasped my head in great perplexion. What should I do with this‼ Manipulating the mechanical dragon is more like what a Demon Lord would do rather than a Hero. Just by its presence in our country, it wouldn’t be strange if the other countries recognized this as the enemy of humanity. As a result, the mechanical dragon was treated as a closely-guarded Top Secret information, and it was decided to wait for a reply from the Star Dragon Mountain. Ginya was transferred into a newly built dedicated laboratory near the Capital City and should be researching something even today. Furthermore, since Roroa and Colbert joined us, the cash flow had become improved, and her work was further accelerated. ……At a later date, I asked Hilde to sent stomach drugs to Ludwin. Thanks for the chapter Yukkuri-san ! Hahaha...Poor Ludwin, taking care his waifu is even more troublesome than doing his job. Not sure what 'ahis nd' should actually be. Welcome back and thanks for the mass release! It's a deliberate typo to act as a simple 'bot' trap. I will know which site copied my translation and if they will update their site after copying mine. Need 2 more dragon head on those thing upgrade them to Mecha King Ghidorah!!! Would stomach medicine be appropriate for a wedding gift? I also would like to say my cordial thanks for translating the chapter. While reading the content I honestly came to learn much more about Ludwin, Ginya, Souma. Also the monster parts and mysterious dungeon components are very interesting.